QLife National Project Manager Lucy Abbot joins HPR to talk about the QLife Project, one of the programs created by her organization, the National LGBTI Health Alliance. It’s Australia’s first nationally oriented counselling and referral service for people from the LGBTI community. QLife offers phone counselling and web chat services. She explains why this is beneficial for LGBTI people and why it is relevant to health professionals. Lucy joined the National LGBTI Health Alliance in January 2018 as National Project Manager for QLife: a national LGBTI-specialist telephone and web counselling service. Lucy has worked for 15 years in the Aboriginal mental health and drug and alcohol sectors, in both government and non-government agencies, with a recent focus on workforce support. She has a passion for, and commitment to, social justice, sustainability and wellbeing, and is excited to be working for her own community in this role. Lucy has a BA (Hons) in Third World Studies and Womens Studies. Originally from the UK, Lucy has lived in Sydney for 23 years, except for one year spent in Alice Springs. Tabetha Moreto: Hello everyone. Welcome to Health Professional Radio. I’m your host for today, Tabetha Moreto. Our guest today is Lucy Abbott, QLife National Project Manager at the National LGBTI Health Alliance. She joins us today to talk about her organization and the wonderful work that she does there. Without further ado, welcome to the show, Lucy. It’s so nice to have you here. Lucy Abbott: Thank you very much for inviting me. Great to be on the show. T: So Lucy, please tell the audience more about yourself and the nature of your work. L: Well, I’ve just recently started at the National LGBTI Health Alliance managing QLife. So QLife is a national telephone, web counseling and referral service for lesbian, gay, bisexual, transgender and intersex communities. We’re an anonymous service provided by and for the LGBTI communities and their allies. And the QLife service operates from 3:00 p.m. to midnight every day of the year on a 1-800 number. The calls are free and we also operate web chat through the website too. T: Wow, this is very interesting. So can you tell us how did your organization start? L: Well, QLife is just five years old. We’re very young but what’s unique about QLife is that it’s delivered by five-partner organizations across Australia with a shared history of passion and commitment for our communities. So the National LGBTI Health Alliance hosts the National QLife team from our new town offices and we support the organizations that actually provide the telephone and web chat services. So those services are delivered in Victoria by switchboard in New South Wales by 2010 which incorporates the gay and lesbian counseling service. In Queensland, it’s provided by “Diverse Voices” and in WA by “Living Proud.” So together, our five organisations have got over 150 years experience in delivering counseling and support to our communities. And yes, what a great history and the national team here in Sydney we coordinate kind of volunteers and outreach in states that we don’t have a partner organization. So with that, we make sure we get the national awareness and coverage. T: I see. So how many people benefit from this QLife Project of yours? L: That’s an interesting question. It’s hard to really quantify that because what’s very unique about our services that were anonymous. So we don’t have the names and contact details of anyone who calls us. So we do get repeat callers but we don’t have any way to monitor that because of our” anonymity” which is a very particular feature of our service and for our communities. It offers a level of safety and security in their calls. So it’s a little bit hard for us to measure that. T: That’s okay. No problem. I totally understand. That’s the wonderful thing about your service. Because of your anonymity, people are able to call about their concerns and remain anonymous because that’s been the concern for many years regarding these types of services. L: That’s right, correct. Yes. And I wanted a part just to point out that we’re not a crisis service. We’re early intervention service. Because we don’t operate 24 hours, we can’t provide crisis response. So we’re an early intervention and so we provide lots of resources as well on our website for health professionals. We’ve got guides on coming out by sexuality, rural and regional issues. So health professionals call on these guys quite a lot and we also have a whole series of lived experience videos available on YouTube. So the health professionals it’s kind of really value those resources after the community. T: Yes and speaking of health professionals, how was the QLife Project relevant to health professionals? L: I would say, it’s hugely relevant to health professionals. It provides as a referring agency. So if you have lesbian, gay, bisexual, transgender or intersex people who are wanting support, you can refer them to our telephone or web chat service and I’ll give the number later. They can also access our resources and guides on the website which is qlife.org.au and lots of health professionals, we present a lot of conferences across Australia. Our feedback at conferences as health professionals really value this service because we appear driven service but we also provide counselling. So we’ve got that duality happening that the practitioners really value being able to refer to us. T: That’s wonderful to know. Now, Lucy, if you don’t mind, can I ask you a personal question? T: Thanks. Actually, I ask this to all of my guests who come on the show. So can you tell us Lucy, why are you so passionate about the QLife Project? L: I’m passionate about it because I’m working with my own community. I’m in my 50s. I’ve spent many years working with other communities and in mainstream services and as a lesbian to be able to work in my own community has an extra layer of meaning and significance. And as a more mature person, I can see the value of QLife for people who are going through different stages of their journey in life whether it’s about coming out, whether it’s about questioning your gender or your body, whether you’re looking for support and services. QLife offers so much and it’s got such great integrity as a service with being peer-driven and the partnership that gives us kind of local expertise. I love everything about it. T: Yes. That’s where it all starts, Lucy, it’s love. Love conquers all. L: That’s right. It does. T: Lucy, I would love to chat with you more but we’re running out of time. Before we go, Lucy, what is your main takeaway message to all of our listeners out there? L: I would say, call QLife if you have any questions. We have staff and volunteers available on the phones from 3:00 p.m. to midnight. All of our volunteers and staff are part of the community. Our services have grown alongside our communities and they reflect our communities and we understand what makes people strong and what can help people when they’re struggling. So I would say call us. Our number is 1800-184-527 or you can log in to the website, qlife.org.au for a web chat session, knowing that you’re about to speak to one of your community. T: That was a fantastic message. Thank you so much, Lucy, for coming on the show. 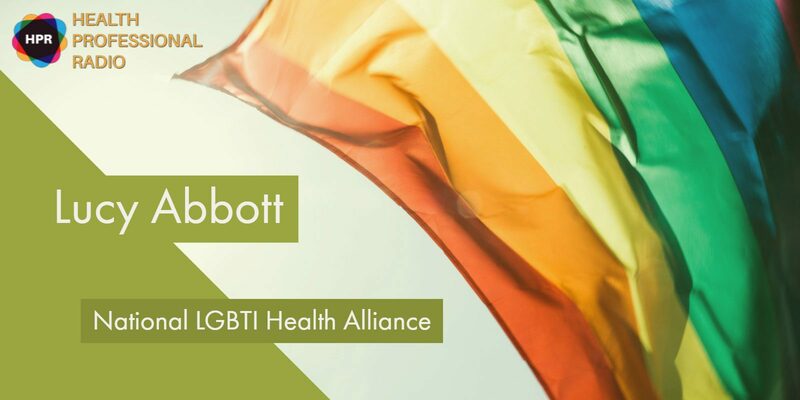 T: And that was Lucy Abbott, QLife National Project Manager at National LGBTI Health Alliance. If you liked this interview, transcript and archives are available at www.hpr.fm. We’re on all social media platform. So don’t forget to follow, like and subscribe. Show us some love by subscribing to our HPR YouTube channel. We’re also available for download on SoundCloud and iTunes. I’m Tabetha Moreto and this is Health Professional Radio.